Dr. Eric Steinbach, DDS is a top-rated cosmetic dentist located in Brooklyn, NY, who specializes in enhancing smiles through the latest aesthetic procedures. Dr. Steinbach utilizes state-of-the-art equipment and instrumentation to provide implant placement and restoration, simple and complex periodontal surgical procedures, Invisalign® and Invisalign Express, porcelain veneers, ceramic crowns, flexible dentures, wisdom teeth extraction, crown lengthening, teeth whitening and tooth-colored fillings. At Park Slope Dental Aesthetics located in the Park Slope neighborhood of Brooklyn, Dr. Steinbach has amassed a loyal clientele. A Brooklyn native, he opened this state-of-the-art equipped office in 2014 after initially launching his career in private practice family dentistry in Los Angeles. Dr. Steinbach graduated from New York University College of Dentistry with honors in 2009 and went on to complete a residency in general dentistry at Long Island College Hospital, followed by extensive training in cosmetic dentistry with some of best clinicians in the country at NYU’s prestigious Advanced Aesthetic Dentistry program. Patients praise Dr. Steinbach not only for his technical skill and willingness to explain diagnosis and procedures in easy-to-understand language but also for his personable bedside manner, which manages to put even the most dental phobic patients at ease. Patient comfort is paramount to Dr. Steinbach. In addition to utilizing the most advanced diagnostic and treatment technology, Park Slope Dental Aesthetics features examining chairs that are heated and equipped with a massage function. Those combined with flat screen TV monitors and Netflix further help patients relax during dental procedures. Dr. Steinberg is a member of the American Academy of Cosmetic Dentistry. Park Slope Dental Aesthetics is a comprehensive dental care facility covering everything from checkups and cleanings to oral surgery and multiple tooth reconstruction. 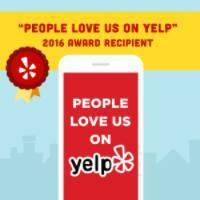 We are proud to announce that Park Slope Dental Aesthetics: Dr. Eric Steinbach, DDS was awarded the 2016 and the 2017 People Love Us On Yelp Award.